A Conference not to be missed! And certainly not something that Britain's Palestine Solidarity Campaign could organise given its slavish adherence to a 2 State Solution and the PA's diplomatic strategy of reliance on the West. At a time when we have seen Hamas, an avowedly sectarian organisation, rise to the leadership of the Palestinians, this Conference is a good opportunity to reassess the Left's own strategy and perspective and our own analysis of where we are going and what the current period means. The Rise of Hamas, the Fall of Leftist Ideology? Jamal Zahalka (Chair of the National Democratic Assembly/Tajamu and Member of Knesset)The Relationship between the Palestinian Left in Israel and WBGS: Joint or Separate Struggle? You do not need a PayPal account to buy online. If you do not have a PayPal account, click 'Continue' under the question 'Don't have a PayPal account?' which is on the left of the log-in box. Last summer whilst on holiday I took a copy of Francis Nicosia’s Zionism & anti-semitism in Nazi Germany for light reading! An appalling apologia for the collaboration of the Zionist movement in Germany with the new Nazi government, I said that I would do a review of that book and its predecessor, The Third Reich and the Palestine Question. This was completed and reprinted in the Weekly Worker late last year and I am now including it on the blog as an aid to those interesting in the subject of how the Zionist movement, which today is so quick as it is to accuse its opponents of ‘anti-semitism’ was not always so concerned about anti-semitism. When in trouble accuse your critics of anti-Semitism. Even if they are Jewish and even if they are Zionist! [Israel Finance Minister: Goldstone Is 'Anti-Semite Steinitz is of course right that it is possible to be a Jewish anti-Semite. The history of Zionism is full of such examples. The past 20 years have seen the rise of the ‘New Zionist Historians’. Although politically they differ enormously, they have one thing in common. A desire to sweep aside Zionism’s invented history where propaganda and political convenience masqueraded as fact. A history whose purpose was more political and ideological than academic and investigative. No question is more sensitive than that of the relationship between Zionism and the Nazis. Popular history holds that the Zionists led Jewish resistance to the Nazis, including the Warsaw Ghetto Uprising and that Israel was established as a refuge from anti-Semitism. The Kasztner Trial in Israel from 1954-8 concerning Zionist collaboration in Hungary has been all but airbrushed from popular memory, even though it led to the fall of the Sharrett Government in 1955. The Ha'avarah Transfer Agreement between Nazi Germany and the Zionist Organisation, an agreement which led to Palestine being swamped with German goods between 1933 and 1939, with the Zionists operating as overseas salesmen for German companies has also been forgotten. the forces unleashed by Hitler in all their horror must therefore be harnessed to the advantage of Zionism… While hopes and efforts for the rescue of Europe’s Jews continued, the struggle for a Jewish state became the primary concern of the movement… the Zionist realpolitik developed a rigorous logic and a momentum of its own in which the humanitarian considerations were subordinate. [The Modern History of Israel, pp. 188, 190, Weidenfeld & Nicholson, 1975]. 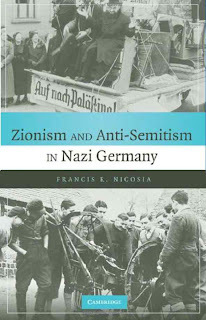 Nicosia has documented both the relationship of the German Zionists with the Nazi government and the diplomatic factors that led to the Nazis adopting a pro-Zionist foreign policy externally. In so doing Nicosia has explored a number of archives in Germany, Israel and Britain. His problem was how to reconcile this with support for Zionism. His thesis that the Zionist movement had to do deals with the Nazis in order to rescue German Jews fails to explain the ideological symmetry between them and the consequences of that shared outlook on the Jews place in Germany. What marked out Zionism from all other Jewish movements was not simply that ideologically Zionism was a mirror image of anti-Semitism but the fact that some of the most rabid Jew-haters sought their legitimation from Zionism. Amos Morris-Reich, who attempts to play down Ruppin’s belief in the race sciences, nonetheless asks ‘why did Ruppin not express his reservations of Günther in the privacy of his diary, but, on the contrary, describe the conversation as a pleasant encounter?’ [Arthur Ruppin’s Concept of Race, Israel Studies, volume 11, number 3, p.2]. The answer is fairly obvious and what Reich forgets is that Ruppin was at the forefront of colonising another people’s land and justifying it through racism. Of course the Zionists have subsequent tried to play this down and although the meeting with Gunther is mentioned in the German edition of Ruppin’s diaries, it was erased in the English and Hebrew editions (edited by Alex Bein). 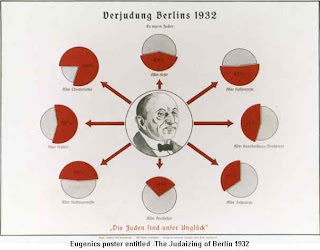 Assimilation, not anti-Semitism, was German Zionism’s main enemy, and this did not change after 1933. As Kurt Blumenfeld, Secretary of the ZVfD (1909-11) and of the Zionist Organisation from 1927, said in a letter to Walter Rathenau, the Jewish government minister assassinated in 1922: ‘Under no circumstances does a Jew have the right to represent the affairs of another people.’ [Nathan Weinstock, Zionism: A False Messiah, p.135, Inklinks, 1979] This was an abject capitulation to the ideas of Nazi racism over a decade before they took power. ‘Blumenfeld identified the political left in Germany as the immediate danger, especially to Jewish youth.’ [2:60] Thus at the very time that Hitlerism was gaining ascendancy, the Zionist movement identified the left as the main danger! Hitler described Zionism as a ‘great movement’ which had resolved his ‘indecision’ as to whether or not the Jews were a separate people. [A Hitler, Mein Kampf, James Murphy, April 1942, p. 41][op. cit. p.184] He certainly doubted Zionism’s ability or even sincerity in wishing to build a Jewish State in Palestine but he was no opponent. On the contrary Hitler supported those who saw ‘the utility of Zionism in a future National Socialist state.’ [2:72] In January 1938 Hitler made a specific commitment to continued Jewish emigration to Palestine.’ Hitler ruled that ‘Jewish emigration from Germany should continue to be promoted with all possible means, and it should be directed in the first instance to Palestine.’ [1:141] In the debates over Ha'avarah [Edwin Black, The Transfer Agreement] Hitler consistently supported its continuance against growing opposition from the Interior and Foreign Ministries. The Nazis support of Zionism was partly because they also saw it as a white settler colonial movement. Leopold von Mildenstein, head of the SD's Jewish department, went on a six-month visit to Palestine in 1933. 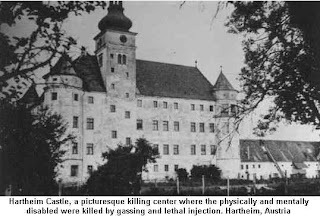 This was followed, from 26th September to 9th October 1934, by a series of 12 articles in Goebbel’s paper Der Angriff. [Jacob Boas, A Nazi Travels to Palestine, History Today, January 1980, p.35] which waxed lyrical about Jewish settlement in Palestine. Hanna Arendt tells how Mildenstein required his successor, Adolph Eichmann, to read Herzl’s Der Judenstaat which converted Eichmann to Zionism. Eichmann even protested against the desecration of Herzl’s grave in Vienna in 1939. [Arendt, Eichmann in Jerusalem, pp. 40-41, Penguin, 1979] [1:61] Both Mildenstein and Eichmann attended the Zionist Congresses at Lucerne and Zurich in 1935 and 1937 as observers. The Transfer Agreement (Ha'avara) in 1933 was agreed between the Zionist movement and the Nazis whereby German Jews leaving for Palestine could place their assets in a special frozen account in Germany which would purchase German goods. The goods would then be exported, payment for which would be deposited in an account held by Ha'avara Ltd in Tel Aviv. Alarm was particularly expressed at the participation of non-Jewish businesses in the Boycott. ‘The Foreign Office was flooded with letters from German firms with branches abroad, expressing alarm over the intensity of anti-German feeling and propaganda over alleged atrocities against Jews in Germany.’ Yet at the very time that Nazis leaders were expressing their alarm over a Boycott, the Zionists stepped in to reassure them. If they could only reach an agreement over Ha'avarah and trade with Palestine, then they would put an end to all talk of Boycott. The Zionists relaxed the pressure on the Nazis precisely at the time, at the start of their rule, when it should have been used to maximum effect. The Boycott was extremely popular internationally. It has been adopted by the labour movement in the United States and the Nazis were terrified of what it could do to their exports. In 1933 the 18th Zionist Congress in Prague avoided voting on resolutions supporting Haavara, whilst not supporting Boycott. Initially Berl Locker for the Zionist Executive denied all knowledge of Haavara. [1:53] In 1935 the 19th Congress at Lucerne rejected Boycott and endorsed Ha’avara. Nicosia differentiates between the ‘reluctant’ collaboration of the mainstream Zionists and the enthusiastic collaboration of the German Revisionist leader, Kareski, who saw in Hitler’s ascendancy ‘a positive rather than a negative reality.’ [2:198] This is extremely weak since all wings of the Zionist movement saw their vindication in the rise of Hitler. In fact the Revisionists outside Germany, and Misrahi, were the only section of Zionism to oppose haavara and trading with Nazi Germany. Nicosia tries to justify the Zionist role in Nazi Germany by arguing that they ‘were not spared the treatment meted out to non-Zionist Jewish organisations.’ [2: 100/101] But this was not true. And even were it so, a sharp differentiation has to be made between Zionism as a political movement and Zionists as individuals. The paper of the SS, Schwarze Korps, argued that the Jews had to be separated into 2 categories – Zionists and assimilationists. One feature of Zionist policy has always been opposition to Jewish emigration to countries other than Israel. During the Soviet Jewry campaign Zionist leaders were also clear that rescue should be solely to Palestine. Nicosia glosses over the fact that under the Nazis, the Zionist movement pursued this policy. [2:125] ‘the CV criticized what it believed to be the efforts of the ZVfD to direct Jewish emigration exclusively to Palestine at the expense of other suitable destinations.’ [2:168, citing C.V.-Zeitung, 13.10.1935.] This gives the lie to the argument that Ha’avara was designed to rescue Jews. In 1937, the year when trade between Palestine and Germany peaked at over 31 million RM, the number of Jews immigrating from Germany was at an all-time low of 3,700. [1: 212-213] The influence of Ha’avara on the number of immigrants was marginal but its benefits for the Zionist economy were immense. The information that Nicosia researched confirms much that was already known about the attitude of the Nazis towards Zionism. He also confirms, despite his best endeavours, that Zionism was a movement of collaboration. The followers of Zionism were individuals who moved politically between Zionism and political movements to its left. It was the failure of the Left in Europe that led to Jews supporting a Jewish volkish nationalism. And as the war approached in Poland, where over 3 million Jews lived and where the fight against anti-Semitism intensified, Jews abandoned Zionism which they saw as merely a reflection of anti-Semitism. 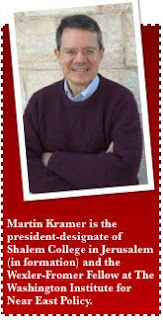 Martin Kramer is President-Designate of Shalem College as well as being a fellow of Harvard University, alongside fellow racist, Alan Dershowitz. Shalem College is supposed to be Israel’s first ‘liberal’ arts college. Clearly the Israeli and non-Israeli definition of 'liberal' have different meanings. As the excellent article on Electronic Intifada makes clear, the Kramer's (& most of Israel's) definition of liberalism is confined to Jews. Palestinians should make themselves scarce and preferably their women should be 'encouraged' not to give birth. Well you couldn’t make it up. As you might have guessed there are historical precedents to Kramer's racist outpourings. On July 16, 1941, Hugo Höppenerner, a Higher SS and Police leader in the Warthegau (the part of Poland annexed to Germany), wrote to Adolph Eichmann (Documents of Destruction - R. Hilberg, Quadrangle Books, Chicago, 1971, p. 87). Höppenerner's suggestion as to how to solve the 'problem' of not being able to feed all the local Jews was quite simple – kill them! And for those for whom it was not possible or necessary, i.e. Jewish workers, then the alternative solution that was put forward was that of sterilisation of Jewish women. This 'solution' that was put forward repeatedly as an alternative to the use of the gas chambers, but because of technical problems it wasn't possible to use to 'solve' the Jewish question. That is it wasn’t possible to sterilise quickly enough the necessary millions of Jews. 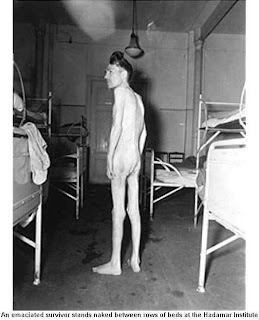 In any case the Hereditary Health Courts of Nazi Germany regularly ordered the sterilization of Germans, over 400,000 of whom were held to be mentally and physically defective. In the case of the Jews, resort had to be had to the use of gas. Enclosed is a memorandum on the results of various discussions held locally in the office of the Reich Governor. 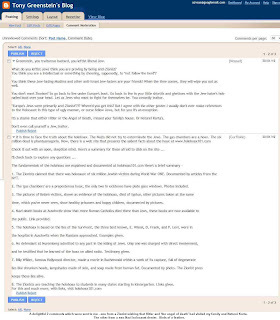 Subject: Solution of the Jewish question 4) This winter there is a danger that not all of the Jews can be fed anymore. One might weigh honestly, if the most humane solution might not be to finish off those of the Jews who are not employable by means of some quick-working device. At any rate, that would be more pleasant than to let them starve to death. 5) For the rest, the proposal was made that in this camp all the Jewish women, from whom one could still expect children, should be sterilized so that the Jewish problem may actually be solved completely with this generation. Fast forward 70 years and a ‘fellow’ of Harvard University Martin Kramer (the alma mater of fellow racist, Alan Dershowitz – do they breed fascists and racists at Harvard these days?) puts forward proposals to sterilise the Arabs of Greater Israel. Yes I know, birds of a feather and all that! Below we reprint an excellent article on Electronic Intifada. 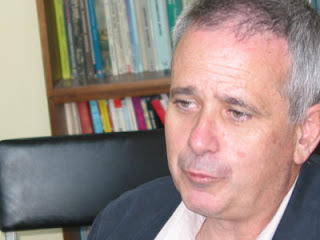 A fellow at Harvard University`s Weatherhead Center for International Affairs, Martin Kramer, has called for `the West` to take measures to curb the births of Palestinians, a proposal that appears to meet the international legal definition of a call for genocide. 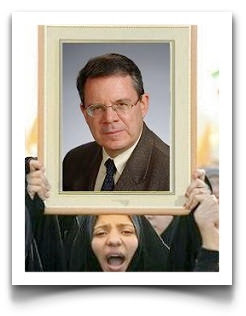 In the speech Kramer rejected common views that Islamist `radicalization` is caused by US policies such as support for Israel, or propping up despotic dictatorships, and stated that it was inherent in the demography of Muslim societies such as Yemen, Iraq, Afghanistan and the Israeli-occupied Gaza Strip. Too many children, he argued, leads to too many `superfluous young men` who then become violent radicals. Due to the Israeli blockade, the vast majority of Palestinians in Gaza are now dependent on UN food aid. Neither the UN, nor any other agencies, provide Palestinians with specifically `pro-natal subsidies.` Kramer appeared to be equating any humanitarian assistance at all with inducement for Palestinians to reproduce. 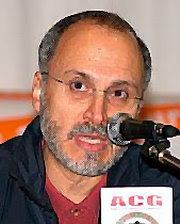 Pro-Israel speakers from the United States often participate in the the Herzliya conference, an influential annual gathering of Israel`s political and military establishment. This year`s conference was also addressed by The New York Times columnist Thomas Friedman and, in a first for a Palestinian official, by Salam Fayyad, appointed prime minister of the Ramallah-based Palestinian Authority. Kramer`s call to prevent Palestinian births reflects a long-standing Israeli and Zionist concern about a so-called `demographic threat` to Israel, as Palestinians are on the verge of outnumbering Israeli Jews within Israel, and the occupied Palestinian territories combined. Such extreme racist views have been aired at the Herzliya conference in the past. 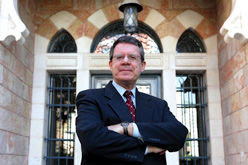 In 2003, for example, Dr. Yitzhak Ravid, an Israeli government armaments expert, called on Israel to `implement a stringent policy of family planning in relation to its Muslim population,` a reference to the 1.5 million Palestinian citizens of Israel. 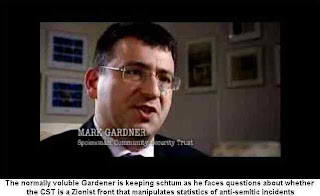 On 10th February I sent a letter to Mark Gardener, spokesman for the Zionist Community Security Trust, which records incidents of 'anti-semitism' in such a way as to 'prove' that anti-semitism is increasing alongside criticism of Israel (rather than Israel's actions being responsible for anti-Semitism). i. 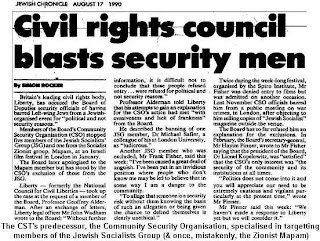 When on 4th December Jonathan Hoffman of the Zionist Federation had apparently been subject to anti-Semitic jeering at a Boycott meeting at SOAS. The allegation was made by a far-right Tory activist and the BBC, after a deluge of protest, completely changed its report when being made aware of a video of the 'anti-Semitic' jeering. This did not prevent Gardener lambasting SOAS authorities for their attitude to 'anti-Semitism'. I asked Gardener whether he had recorded this allegation as another 'anti-semitic' incident. ii. I also asked Gardener about a meeting at the House of Commons on 27th January 2010, Holocaust Memorial Day, organised by the International Jewish anti-Zionist Network. The main speaker was Hajo Meyer, a survivor of Auschwitz. 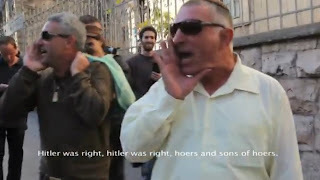 He was subject to considerable abuse by Zionist hecklers, including Jonathan Hoffman, and a bearded friend of Hoffman, as he was being escorted out by the Police gave a sieg heil salute. Again I asked that this be recorded as an anti-Semitic incident. (also see a report on how the 'official' HMD authorities banned Hajo Meyer in Scotland. iii. I referred to an incident involving Gardener's CST thugs, when the latter violently removed two peaceful Jewish anti-Zionists from a meeting at which David Bellamy was due to speak at at the Institute of Education on 9th February 2010. I asked how the behaviour of CST's stewards in seeking to suppress dissent within the Jewish community was compatible with its charitable objectives. iv. In a further e-mail of today, I have also submitted two further anti-semitic incidents for Mr Gardener to record. Both involve comments sent to this blog, one wishing that Hitler had exterminated my family and those who belong to Neturei Karta and the other from a holocaust denier. Unsurprisingly, I did not receive a response to my previous e-mail. Hence why I am following it up in case, as I said in my letter, it is simply pressure of work that is preventing the normally voluble Gardener from making a comments. ‘'CST spokesman Mark Gardner said: “Mr Hoffman merely repeated what the South African Human Rights Commission had said about Bongani Masuku’s alleged incitement of antisemitism. For daring to raise this he was jeered with outright hatred. You clearly categorised what took place at the meeting as the anti-Semitic abuse of Jonathan Hoffman, despite the evidence of others to the contrary. I have detailed the history of what took place in an article on my blog and Jonathan Hoffman posted 3 comments underneath the article, on 28th December, by way of reply, reasserting that what took place was, in his view a clear instance of anti-Semitic abuse. I am therefore writing to you to ask whether or not you have recorded what took place at SOAS on 4th December 2009 as an anti-Semitic incident? In view of the forthright nature of your comments above, I will take a refusal to answer or a non-committal response as confirmation that the incident above was indeed recorded as an anti-Semitic incident. On 27th January, Holocaust Memorial Day, the International Jewish anti-Zionist Network, held a meeting at Portcullis House, Westminster, where the speaker, Hajo Meyer, a survivor of Auschwitz extermination camp, was subject to virulent abuse by, among others, the said Jonathan Hoffman. Mr Hoffman described Mr Meyer as a ‘dancing bear’ among other comments, something which is not only insulting in itself but anti-Semitic, belittling as it does Mr Meyer’s terrible experiences. I am therefore asking that this attack on Mr Meyer be recorded as an anti-Semitic incident. Please confirm that this will be done. Yesterday, 9th January 2010, David Bellamy came to speak at the Institute of Education in London, on the subject of Israel and the Environment. A picket was held of the meeting and two Jewish anti-Zionists who were present at the meeting asked questions of Mr Bellamy after his speech. They were not in any way disruptive but were clearly critical of the context and substance of Mr Bellamy’s speech. This is quite normal in public meetings. Immediately it was discerned that they were critical of Israel and Mr Bellamy, they were physically ejected by stewards from the Community Security Trust. What took place raises fundamental questions as to the role of the CST. 1. To promote good race relations between the Jewish community and other members of society by working towards the elimination of racism in the form of anti-semitism. 2. To promote the efficiency of the police within the community at large and the promotion of good citizenship and greater public participation in the prevention of crime with particular reference to the maintenance of public order and racially motivated especially anti-semitic crime. 3. To relieve the victims of racial or religious harassment and especially anti-semitic harassment who are in need or who have suffered hardship or distress. 4. To promote research into racism and anti-Semitism and to publish the useful results of such research and otherwise to promote public education about racism and anti-semitism. 5. To promote and support such other charitable purposes or institutions as the trustees may from time to time think fit. Perhaps you would be so kind as to tell me just what part of the above remit covers the ejection of peaceful (Jewish) members of an audience who attend and ask questions at a meeting of the Zionist Federation? Or is it the view of the CST that the presence of anti-Zionists at such a meeting is, in itself, anti-Semitic? I sent a letter to you, by e-mail, on 10th February 2010. For some strange reason I have not yet received a reply. Knowing how busy you and your colleagues must be trying to find examples of anti-semitic incidents, I suspect that my letter might have escaped your attention or be sitting even now in your in-tray. I am therefore writing to you again to remind you of my letter and with a further two examples of anti-semitic incidents which I am formally asking you to record. You will also be aware that the original allegation of anti-semitism was made by Raheem Kassam, an activist in Conservative Future. When the BBC was made aware that a video of the said meeting did not show any evidence to support the above allegation it totally revised its report. 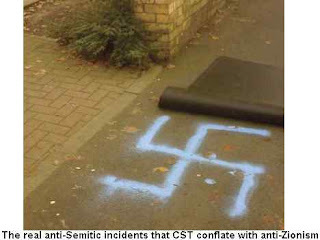 In view of the widespread belief that CST conflates statistics of anti-semitic incidents and anti-Zionism, can you confirm whether or not this alleged incident was recorded as an anti-semitic incident? In the absence of any response I will assume, given your remarks, this has been recorded. 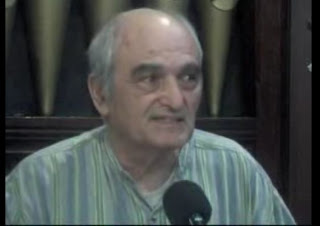 I also wrote to you about an anti-semitic incident on 27th January 2010 when a survivor of the Auschwitz concentration camp, Hajo Meyer, was subject to considerable abuse by Zionist hecklers. I therefore asked that this be recorded as an anti-semitic incident. I have also been made aware that one of those removed from the meeting at the House of Commons gave a ‘sieg heil’ salute. Clearly this was of anti-semitic intent. Can you therefore confirm whether or not this incident has been recorded? I will assume, unless I hear to the contrary, that you have failed to record the incident because it involved members of the Zionist Federation. I also wrote to you about the ejection of Jewish anti-Zionists from a Zionist Federation Meeting on 9th January at the Institute of Education, where David Bellamy was due to speak. Two Jewish anti-Zionists who were present at the meeting asked questions of the speakers. They were not in any way disruptive but were clearly critical of the idea that Israel makes a positive contribution to the environment. Immediately it was clear that they were anti-Zionists they were physically ejected by stewards from the CST. I therefore asked you how what CST did, both at this and previous meetings, where they target Jewish dissidents, was compatible with your charitable aims and objectives. Unsurprisingly you seem to have had difficulty answering this question, which in itself begs further questions. I also have another two anti-semitic incidents to report. As you may be aware, I run an anti-Zionist, anti-racist and socialist blog. I have received a number of abusive comments in the time it has been running, most of which are from Zionists and a few from fascists. On 30th January 2010 I received two posts, one from a Zionist who believed I was a traitor and expressed his regret that Hitler had not exterminated my family and also Neturei Karta. The other post was from a straightforward holocaust denier. Both posts are clearly anti-semitic and I would ask that you record both as anti-semitic incidents. I include below a screenshot of the posts as seen in the Comment Moderation box. In view of the time that has already elapsed since my previous letter I look forward to a swift reply. It is of course the ultimate, Zionist logic. If you stay in the diaspora or if you leave and then show some sympathy with the 'goys' (non-Jews) then you deserve nothing better than to be exterminated. Just like those who died in the holocaust, you have brought it on yourself. This of course was exactly the attitude of the Zionist leadership during the holocaust. The Holocaust barely figured in their deliberations, but the 'dangers' of saving Jews when Palestine was not involved, were indeed the subject of deliberations. 'If the Jews are faced with a choice between the refugee problem and rescuing Jews from concentration camps on the one hand, and aid for the national museum on the other, the Jewish sense of pity will prevail... We are risking Zionism’s very existence if we allow the refugee problem to be separated from the Palestine problem.' [Y E1am, ‘Introduction to Zionist History’ Tel Aviv, 1972, pp.125/6 cited by Machover/Offenburg, Khamsin 6. see also ‘Ot’ paper of youth cadre of Mapai, No. 2 Winter 1967]. So when 2 Israeli settler supporters shout 'Hitler was Right' they may be stupid but even in their stupidity they understand the 'logic' of Zionism. If Jews won't emigrate to Israel and insist on 'assimilation' then deserve all they get. 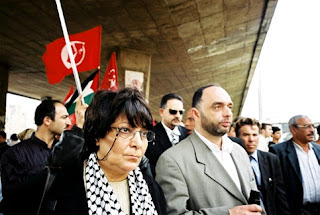 What is interesting about this scene is not just the fact that 2 Zionists are so open about what support for the Palestinians should imply, but that they receive sympathy and support from other passers by. The Police come and go away, after all they are not Arabs or leftists, and an orthodox Jew makes it clear that he agrees with them. This is not a unique phenomenon. In the 1980’s a group of soldiers in the Golani brigade set up an ‘Eichmann Commando’. Zionism is synonymous with occupation and oppression. They therefore identify with other occupiers and oppressors. And if a Jew should side with the ‘enemy’ then they deserve all they get, yea even gassing and burning. So you see there is a ‘logic’ in the madness of Zionism. 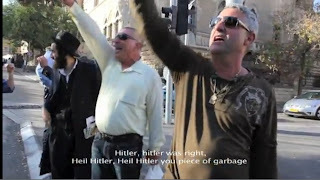 Shouting ‘sieg heil’ in Israel is not an offence. Protesting against confiscations definitely gives offence. ‘Ashkenazis to the ovens’ causes no upset, resisting the occupation does. Bearing in mind that these are clearly Oriental Jews to whom the holocaust means nothing anyway, their reaction was perfectly understandable if a little too open for comfort! ‘New anti-semitism?’ Of course not, it’s just an old theme tune. Zionism consorting with the enemy. Writing in Haaretz, Reut Institute Founder Gidi Grinstein, who formerly worked in the office of war criminal Ehud Barak, describes an "unholy alliance" aiming to turn Israel into a pariah state and recommends a comprehensive policy approach to address the challenge. We need not detail ourselves with the conspiracy aspect of this analysis, the unholy alliance. This is something beloved of conspiracy theorists. Hitler seized upon the Jews because they could explain both capitalism and communism and be blamed for both. One enemy as Hitler said is enough for the masses to digest. Likewise Grinstein and all the other propagandists know that presenting a multitude of enemies diffuses the message. Better to say we are all in league with Hamas! But the essential point is true. Any campaign which confines its opposition to Israel to just its policies will fail, because it fails to understand why Israel behaves like it does, i.e its Zionist and settler colonial nature. That is why 2 States organisations like Palestine Solidarity Campaign become little more than inarticulate human rights organisations whose message is lost amid the welter of other such campaigns. Israel is unique and we should shout it from the roof tops. There is no other active settler colonial or apartheid state in existence today. Of course Israel should be delegitimised and democratised. Gidi Grinstein, Haaretz, 01/15/10 A year after Operation Cast Lead, it is increasingly clear: Together with the Second Lebanon War in 2006, the Gaza campaign exposed a dire need for Israel to reform its security and foreign policy doctrine. Many Israelis are frustrated. Over a three-year period, despite overwhelming military, technological and economic superiority, we failed to achieve decisive successes in confrontations with both Hezbollah and Hamas. In 2006, Israel was dragged through a 33-day exchange, with a cost of 133 dead and a trauma to Israeli society that will take years to heal. And in last year's Gaza operation, our superior military power was offset by an offensive on Israel's legitimacy that led to a significant setback in our international standing, and will constrain future Israeli military planning and operations as effectively as any Arab army could. This is a scorecard Israel can't afford to accept. Israel's wars are won, or lost, as much on the drawing boards of strategists and planners as on the battlefield. In its first 20 years of existence, Israel had remarkable military successes, but, notwithstanding the bravery of our soldiers, they were primarily the outcome of an intellectual victory in the war of ideas and concepts. David Ben-Gurion's 1947 "seminar," by which he prepared himself for leading the nascent state in an existential military confrontation, generated a set of principles for Israeli national security many of which are relevant today. By 1967, it was secure in its borders. In the more than four decades since then, Israel's physical existence has been an unchallenged reality, even if at times its citizens have been subjected to terrorism and violence. Arab intentions to destroy Israel were repeatedly frustrated, to a point where any such effort was effectively abandoned, and Egypt and Jordan signed peace treaties with Israel. Even though Iran may grow into an existential threat, Israel's successes to date have been truly phenomenal. Frustrated by Israel's military might, its adversaries - primarily Iran and its Arab allies in Hezbollah and Hamas - have experimented with politics and violence in their attempt to cap our power and diminish it. Over time, they were able to crystallize a set of ideas that have proven effective. Rather than seeking to conquer Israel, they would aim to bring about its implosion, as with South Africa or the Soviet Union, by attacking its political and economic values. While Israel aims to avoid civilian casualties, they systematically involve civilians on both sides of the frontier. While Israel seeks decisive "victory" in direct confrontations, they value "resistance" and low-intensity conflict. Turning Israel into a pariah state is central to its adversaries' efforts. Israel is a geopolitical island. Its survival and prosperity depend on its relations with the world in trade, science, arts and culture - all of which rely on its legitimacy. When the latter is compromised, the former may be severed, with harsh political, social and economic consequences. The transformative change taking place stems from an unholy alliance with some European elites. 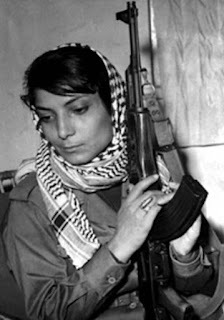 The radical, brutal, sometimes-fascist Islamic states and organizations that reject Israel share aims with Europeans that deny the right of Jews to self-determination. And so, our politicians and military personnel are threatened with lawsuits and arrest when they travel abroad, campaigns to boycott our products gain traction, and our very existence is challenged in academic institutions and intellectual circles. The country is increasingly isolated. To date, Israel has failed to recognize these trends for the strategically significant, potentially existential, threat they constitute. It has mustered neither resources nor personnel to fight them, and lacks a comprehensive approach to the challenge. Many frame the problem as one of public relations, as if what's required is a task force of eloquent speakers that can deliver a three-point punch line in polished English in 30 seconds. This may have been useful in the early days of global news, 20 years ago. Today it is insufficient. Others say that Israel's policy is key, and that a genuine and credible commitment to the peace process will decrease both criticism and delegitimization of the country. But the delegitimization effort would continue even if Israel were to sign a comprehensive peace treaty with the PLO: Indeed, the forces that drive this effort are not Palestinian moderates, but rather people who oppose Israel's very existence. An agreement would only fuel their campaign to converge around the next outstanding issue that comes up between Israel and the Arab world. Israel's delegitimacy is propagated in a few global metropolises - such as London, Madrid and the Bay Area - that are hubs of international NGOs, media outlets, academia and multinational corporations. Therefore, an extraordinary effort is required to respond to and isolate Israel's delegitimizers. We must play offense and not just defense. The most effective barrier to fundamental delegitimization is personal relationships. In every major country, Israel and its supporters must develop and sustain personal connections with the entire elite in business, politics, arts and culture, science and academia. This requires not only an overhaul of Israel's Foreign Ministry, and particularly of its larger embassies, by infusing them with significantly larger operating budgets, but also the mobilization of our civil elite in Israel and overseas for the task. Operation Cast Lead may have ushered in a new era in Israeli national security. The frontiers of our survival have shifted from the battlefields and military to our formal and informal diplomats the world over. This is a struggle that may be less bloody, but is as existentially important. 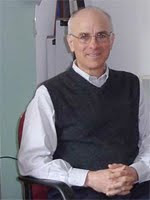 Gidi Grinstein is founder and president of the Reut Institute. Palestine Solidarity Campaign - Beyond Salvaging?